Major environmental groups including Greenpeace and World Wildlife Fund walked out of the UN climate talks in Warsaw in protest at a lack of progress towards a deal to curb rising global greenhouse gas emissions. More than 9,000 representatives from about 195 countries were gathered in the Polish capital for a two-week conference working towards a treaty to be signed in 2015 to fight climate change. But the talks, which ended Nov. 21, have stuttered over several issues, particularly whether rich nations should pay developing countries for losses suffered due to the effects of climate change and a lack of pledges to cut emissions. “The lack of meaningful leadership from governments here has delivered a slap in the face to those suffering as a result of dangerous climate change,” said Greenpeace International executive director Kumi Naidoo. Marcin Korolec, who is chairing the talks, was sacked as Polish environment minister Nov. 20. He remained in charge of the talks but the green groups damned the timing of the cabinet reshuffle. They and many conference delegates said it showed that coal-dependent Poland, which is often reluctant to go along with EU plans for emissions cuts, had little interest in the UN talks. Poland’s decision to host a coal industry summit alongside the climate talks Nov. 18 – 19 also angered the groups. “This is one of the most captured summits ever – captured by corporates and the coal industry with support of the Polish government,” said Dipti Bhatnagar of Friends of the Earth International. Meanwhile, UN secretary-general Ban Ki Moon implored world leaders to make “bold pledges” for cuts in greenhouse gases by next September, but acknowledged that many nations would be late. 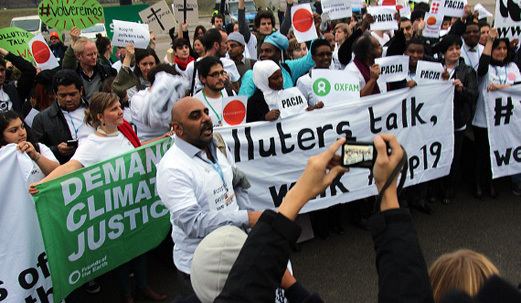 Photo: One day before the planned conclusion of the Warsaw UN climate talks, hundreds of individuals from all continents representing social movements, trade unions and non-governmental organizations – including Friends of the Earth International – walked out of the UN climate conference in protest.